Minister of Foreign Affairs and Premier of Nevis the Hon. 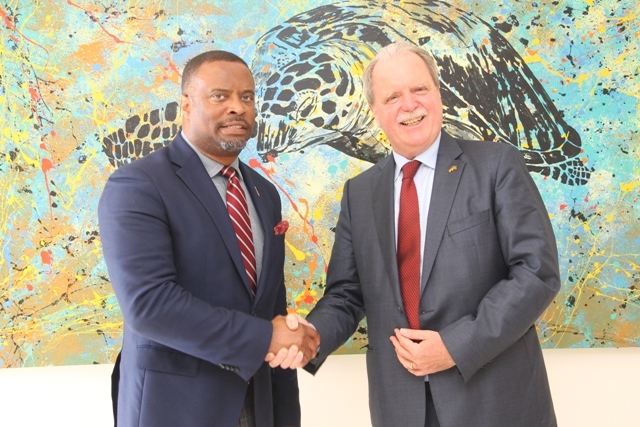 Mark Brantley welcomes His Excellency Holger Michael, the Federal Republic of Germany’s new ambassador to St. Kitts and Nevis, during a courtesy call at Brantley's Pinney’s office May 24. Minister of Foreign Affairs and Premier of Nevis the Hon. Mark Brantley welcomes His Excellency Holger Michael, the Federal Republic of Germany’s new ambassador to St. Kitts and Nevis, during a courtesy call at Brantley’s Pinney’s office May 24. CHARLESTOWN NEVIS – His Excellency Holger Michael, the Federal Republic of Germany’s new ambassador to St. Kitts and Nevis, said he was pleased with his new assignment which promises to be an easy one based on the existing relations between his country and St. Kitts and Nevis. The ambassador was at the time paying a courtesy call on Hon. Mark Brantley, minister of foreign affairs in St. Kitts and Nevis and premier of Nevis at his Pinney’s Estate office in Nevis May 24. The ambassador also spoke of Germany’s cooperation with the federation through the Organisation of Eastern Caribbean States (OECS) and the areas which his country is providing support. In welcoming the ambassador, Brantley acknowledged the long-standing and cordial relationship between Germany and St. Kitts and Nevis. He said he was always pleased to welcome diplomats to the Nevis part of the twin island of St. Kitts and Nevis and thanked Germany for the assistance it has given to the federation over the years.